December 24, 2018– Israel Aerospace Industries (IAI) has inaugurated a new line for the production of stealth-enabling wing skins for the F-35 Joint Strike Fighter. Deliveries of an initial order of 700 are expected to begin in 2019.The production system involves a technology described as Automatic Fibre Placement that puts down layers of 3mm threads to form a skin. The coating kits will be delivered over the coming 20 years, and will generate hundreds of millions of dollars in revenue. IAI approved the new production line in 2015 following a commitment from F-35 prime contractor Lockheed Martin to expand the development of the wing skins, appointing the Israeli company as the subcontractor. 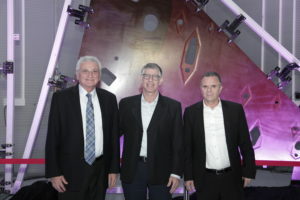 In the photo: Shlomi Karako, IAI EVP and general manager of the Commercial Aircraft Group, Nimrod Sheffer, IAI CEO, and Joshua Shani, CEO of Lockheed Martin Israel.